Pivot3’s virtual storage and compute (vSTAC) software enables true Global Hyper-Converged Infrastructure in a simple, scalable, and affordable appliance model. The enterprise-class HCI Hybrid model pools all resources when stacked in an array as our patented software defines IT operations by dynamically aggregating, load-balancing and optimizing shared storage, compute, and network resources to deliver optimal performance. An array of HCI Hybrid nodes is designed for high fault tolerance and resiliency, capable of withstanding the simultaneous failure of an entire node plus two hard drives. Ready to go out of the box, HCI Hybrid provides Horizon Suite infrastructure and high performance for VDI, Business Continuity and Disaster Recovery initiatives, and more. 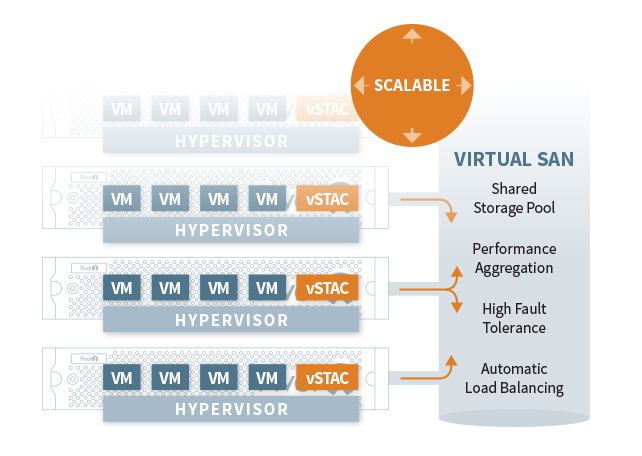 Cluster-aware nodes provide simple scalability for hyper-converged storage and compute. Enterprise-class Horizon Suite delivered in an appliance model. High-efficiency platform for combined back-up and recovery operations. Graphics accelerated options available for remote power users. Unlike all other VDI hybrid storage or converged infrastructure appliances, the HCI Hybrid nodes are uniquely designed to cost-effectively handle the IOPS needs for VMware Horizon View along with the storage capacity needs of Horizon Mirage and Horizon Workspace all within the same node. Run 115-155 View Desktops per appliance and improve desktop user experience with graphics acceleration options. The Hyper-Converged Disaster Recovery platform is based on the HCI Hybrid. It can be combined with a wide selection of disaster recovery software solutions to deliver a high storage efficiency, seamless scalability, and high fault tolerance. Simple plug-and-play software consolidates server and storage resources into a single hardware platform to reduce power, cooling, rackspace, and cost typically associated with systems with separate physical servers and physical storage. Plan for the future simply with the same cost basis for 100 or 10,000 virtual desktops. Horizon Suite has a set of demanding blended IOPS and storage requirements that can be daunting to administrators familiar only with desktops and servers. Pivot3 bypasses the steep storage learning curve and the hefty investment required by over-provisioned SAN or NAS systems. Now you can provide continuity from pilot to production, which results in predictable ROI. Because the HCI Disaster Recovery platform is based on Enterprise HCI nodes, it is possible to recover virtualized environments from the same appliances during a disaster recovery event, there is no need to invest in separate recovery servers.